Μάρκα που εγκαταστάθηκε πρόσφατα για τη σεζόν του 2019.Πρώτο μπάνιο στο πάτωμα με μεγάλη ντουζιέρα, WC και νιπτήρα. Βεστιάριο κάτω με WC και νιπτήρα. A great family holiday villa. We have just left Coral Bay after 2 amazing weeks staying at Villa Ksenia. We are a family of 4, with kids of 12 and 14 yrs. We’ve holidayed in Coral Bay several times before and picked Villa Ksenia due to its proximity to Corallia beach (3 min walk). The walk to Coral Bay strip is 15 mins approx, or you can take the 615 bus from the end of the road. The villa was perfect for us, so quiet and peaceful. We absolutely wouldn’t hesitate to book again. Many thanks to Lisa and Felix for a lovely holiday. thank you so much for your lovely review. we are glad you liked both the welcome pack and water cooler and had a lovely stay so much so you are looking to return. we always use U2, even though you dont need a car at the villa its great to have one to be able to explore the lovely island and they will meet you at the airport and take you to the villa free of charge. Good sized property in quiet location. Very safe for all visiting. Impression of the property was good. Lovely front garden with sturdy picnic bench, well maintained. Clean. Inside was spacious, was great having a gas cooker. Good size fridge freezer. Lovely dining table and books to read. Was also ( I hate to admit it) good to have British T.V to watch the news in the morning. The seating outside was ok and it was good to have quality sunbeds. The pool is a good size though a bit too cold in April but by the end of the holiday we were in it. Upsairs was a good size, very comfy double mattress I must say. And the patio upstairs was a lovely in the morning. You really aren't overlooked at all in this villa, not even upstairs. The only thing I would say is that the shower isn't very powerful, take your time. What was also fantastic was arriving to a lovely Stefado made by Lisa. What a godsend after a late flight. The taxi was arranged to pick us up from the airport by Lisa, brilliant. Felix was around to do the pool twice and if you needed anything they left you a number. All in all, would we go again? Yes. Would we recommend? Yes. Lovely holiday. Thinking about going out for Christmas. Thank you Lisa and Felix you were more than helpful, oh, and lovely white wine by the way. Oh if you are going shopping Philippos shopping you must visit the taverna next door called Astrofegia. The owner will give you a warm welcome and the food is wonderful. its great for future guest to read about the villa, its location etc..
glad your taxi was good, we always use the same firm as they know where we are and are so professional. 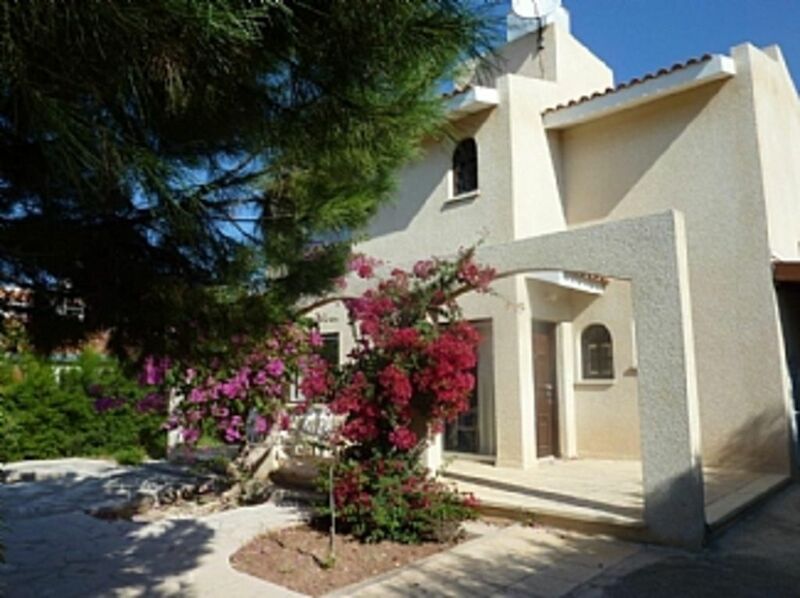 We had a wonderful stay at the villa, its on a quiet cul de sac and is fully enclosed so nice and private, it is literally over the road from the beach so perfect location for us. The welcome pack on arrival was great after so long travelling and the villa guide very useful. We will definitely recommend and come back. we are so happy you had a lovely stay with us, its great for future guests to hear its location being fully enclosed , so safe with children and private. Location is the perfect situation here.5 mins to bus stop 5 mins to beach 5 mins Supermarket short walk to a bar and fish shop.we have stayed here two years running now.best holiday ever, the owners cannot do enough for you and when any little problems occur feel is very good at sorting things quickly..welcome pack very welcome .we would have booked this again for next year but just fancied a change so staying a short way away in another of Lisa and Felix properties. Thank you for taking the time to write a lovely review, we are so glad its been your best holiday ever, its great for future guests to realise how close everything is to the villa, within 5 ins walk there is more than a bar and a fish shop as we have an italian, greek taverna, three bars all offering food and fish/cypriot taverna on the beach s plenty to keep anyone going. We arrived home at 3 am yesterday morning after a great holiday at Villa Ksensia. We felt completely at home from the moment we arrived. As we arrived late evening the welcome pack was greatly appreciated, it contained milk, bread, butter, juice, cheese and jam. There is also a small supply of tea, coffee etc so all in all, more than enough to make a drink and snack until you can get to the shops. Owners Lisa and Felix will also get in any special requests. The villa is comfortably furnished with all usual facilities and it was clean tidy and in good order. The wi fi was excellent, along with the android tv which offered a huge selection of channels and loads of films etc but thankfully we did not use tv much. The water cooler was an added bonus, chilled mineral water on tap was most welcome during the heatwave with unusually high temperatures during our stay. The air conditioning in the bedrooms was also welcome and made our nights more comfortable. The villa is in an ideal location, close to beach, a small supermarket and a couple of bars. the centre of Coral Bay is not far away and easily accessible via the local bus which runs every 10 minutes. The distance to centre of Coral Bay is approx 3 stops but it was far too hot and humid to consider walking and the cost is 1.5€. We did hire a car for some of the time from U2 car rentals as recommended by Lisa and Felix, this company offered a good service at a decent price with no hidden extras. In all honesty car hire is not essential due to the excellent bus service. your shopping back to the villa free of charge - excellent. Owners Lisa and Felix are on hand if there are any problems, they have been more than helpful since our first enquiry and nothing seems too much trouble. My husband and I had a most relaxing holiday and would have no hesitation in returning next year but sadly our preferred dates are all ready booked. Hi Thank you for your lovely review, we are so pleased you had a lovely stay with us and loved both the villa and its location.Its great being close to the centre yet not too close to have the noise of the bars in your villa!We too shop at philipos and its fab for holiday makers to have everything delivered back to their villa free of charge. We have used U2 for years they are a great car hire company should you want to explore. We look forward to you staying with us next year albeit in another villa as this one is already booked! Λόγω της θέσης του είναι ιδανικό για όσους θέλουν να έχουν μια θαλάσσια σπορ διακοπές, υπάρχουν πολλές σχολές κατάδυσης σε τοπικό επίπεδο με τα πάντα, από αρχάριους μαθήματα για μερικές υπέροχες καταδύσεις ναυάγιο για τον έμπειρο δύτη. Georges Ranch για εκείνους που τους αρέσει η ιππασία απέχει 5 λεπτά. Λόγω του κλίματος είναι δημοφιλής τόσο για τους περπάτημα και ποδηλασία διακοπές συν το όφελος των τριών γηπέδων γκολφ που σημαίνει ότι υπάρχει κάτι για όλους. Η βίλα έχει επιλεγεί για τη θέση του ανάμεσα σε 2 από τις καλύτερες παραλίες του νησιού. Κοράλλια είναι 3 λεπτά με τα πόδια και τον Κόλπο των Κοραλλίων 10 λεπτών με τα πόδια - και οι δύο είναι με Γαλάζια Σημαία παραλίες, και οι δύο προσφέρουν μια σειρά από θαλάσσια σπορ, αλλάζει και εγκαταστάσεις ντους και σνακ μπαρ. Ένα αυτοκίνητο δεν είναι απαραίτητο λόγω της θέσης βίλες, ωστόσο, ένα μπορεί να κρατηθεί κατόπιν αιτήματος, μπορεί γκολφ, θεραπείες spa, ιππασία, καταδύσεις κ.α. Πλησιέστερο αεροδρόμιο είναι της Πάφου το οποίο απέχει 30 λεπτά. Η Λάρνακα είναι 1 ώρα και 30 λεπτά. Η στάση του λεωφορείου απέχει 5 λεπτά κάτω από το δρόμο και τρέχει κάθε 10 λεπτά το καλοκαίρι, 20 λεπτά το χειμώνα μέχρι αργά τη νύχτα σε Πάφο και πάνω στο Water Park Ένα ταξί από το αεροδρόμιο είναι περίπου 45 Ευρώ το οποίο μπορούν να τακτοποιηθούν, όπως μπορεί ένας πολύ αξιόπιστη εταιρεία ενοικίασης αυτοκινήτων. Όλες οι παρακάτω αποστάσεις είναι γνήσια, έχουμε περπάτησαν σέρνοντας τα δύο παιδιά μας μαζί! Σούπερ μάρκετ, πολλά εστιατόρια και μπαρ 2 λεπτά με τα πόδια. Coral Beach Hotel 2 λεπτά με τα πόδια. Κοραλία παραλία, 10 λεπτά με τα πόδια από το μέγιστο Coral Beach. 15 λεπτά με τα πόδια στο κέντρο της πόλης Κόλπο των Κοραλλίων. Πάφος Zoo 10 λεπτά οδικώς. Την πόλη της Πάφου, Λιμάνι είμαι Water Park 20 λεπτά με το αυτοκίνητο, Πόλη και το Λατσί απέχει 30 λεπτά με το αυτοκίνητο. Coral Bay έχει τα πάντα για τις τέλειες διακοπές με τους δύο παραλίες, θαλάσσια σπορ, καταδύσεις και πληθώρα από εστιατόρια και μπαρ, τράπεζα, φαρμακείο, γιατρός, μίνι γκολφ, καρτ, πολλά ξενοδοχεία. Είναι πραγματικά την τέλεια όλο τοποθεσία, ωστόσο, θα πρέπει να θέλετε να εξερευνήσετε την Πάφο υπάρχει μια τακτική αξιόπιστη! Φτηνές λεωφορείο στην πόλη μόνο € 1. 50 έως το λιμάνι της Πάφου! Booking Notes: A booking deposit of 25% is required with the balance due 8 weeks before arrival. A security deposit of £200 is required payable on arrival and returned on departure Changeover Day: Fully flexible Notes on prices: Prices are shown per week and include air conditioning and welcome pack. There is a £100 surcharge for Christmas and New year week. We are currently holding 2014 prices for all bookings taken for 2015. Discount available for lets of longer than 2 weeks. Contact owner for detail.